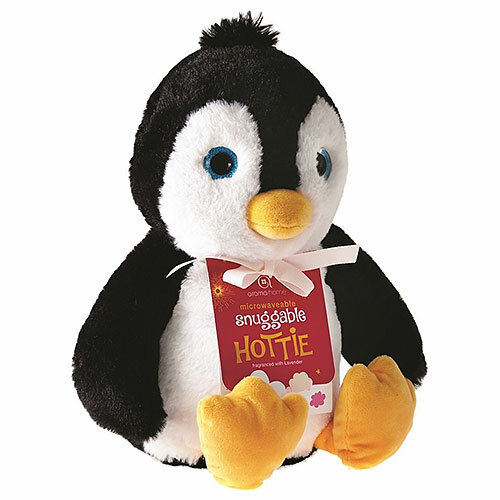 This cute and adorable Penguin snuggable microwave hottie from Aroma Home will keep you warm and cosy all night. Fragranced with lavender to allow you the perfect nights sleep. Snuggable microwave hotties have a removable microwavable tummy insert that can be warmed in the microwave to give a long lasting warmth, helping to aid a perfect nights sleep. Made with super soft fabrics, they’re perfect to cuddle and cosy up with. The microwaveable tummy insert is also gently scented with lavender, with the scent being released when warmed. Place the microwaveable insert into a non-metallic plate and place inside the microwave oven. Heat the microwaveable insert according to the instructions and heating timetable below. The microwaveable insert must be -re-inserted in the outer cover after heating before use. If the hottie gets damaged whilst hot, allow it to cool to room temperature before you dispose of it. Store in a clean and dry environment. Below are reviews of Aroma Home Snuggable Hottie - Penguin by bodykind customers. If you have tried this product we'd love to hear what you think so please leave a review.